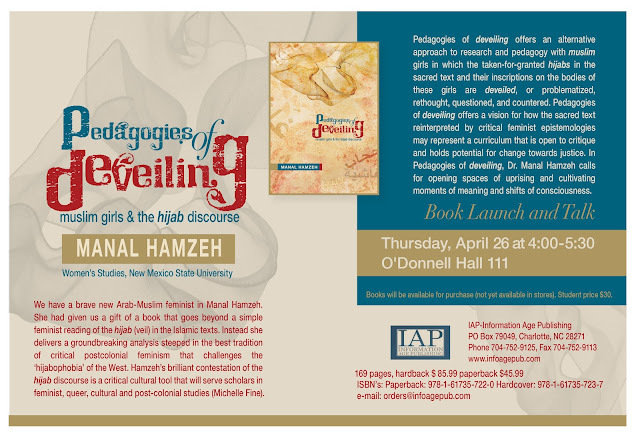 Finally, Dr. Manal Hamzeh's book Pedagogies of DeVeiling:muslim girls and the hijab discourse is out. Officially, Information Age Publishing will be launching it in a few days at the book exhibit of the annual conference of the American Educational Research Association, Vancouver. Dr. Hamzeh's colleagues at NMSU have graciously planned for a book talk/signing on Thursday April 26th @4-5:30 (OH #111)--see poster above.